The South Lawn garden has given Mrs. Obama a platform to speak out about the country's childhood obesity problem, extol the benefits of eating fresh food, and teach children early to appreciate vegetables. The garden now is ready for winter, fitted with protective coverings called "hoop houses," a kind of temporary green house, to help keep various crops -- spinach, cauliflower, lettuce, carrots, cabbage and other greens -- growing during the cold months. In its first year, aides say the garden has ex-"seeded" expectations. It's become so popular that even foreign dignitaries ask Mrs. Obama about it when they meet. Crops have been donated to a neighborhood soup kitchen, and the first lady's green thumb has inspired others to start gardening, too. Local fifth-graders whose public school has a similar garden helped prepare the plot, plant the crops and harvest the produce. They even were brought into the White House kitchen to cook some of the food and experience what eating "fresh" tastes like. During the first lady's recent visit to "Sesame Street" to help Elmo and some kids plant vegetable seeds, Big Bird asked if he had heard correctly that she eats seeds. Not exactly, she replied, but "I do eat what grows from these seeds." She encourages the kids to eat all their vegetables, telling them that if they do, they'll "grow up to be big and strong just like me." The garden also inspired a culinary showdown on an episode of "Iron Chef America." Filmed partly at the White House, the contest paired White House chef Cristeta Comerford and Bobby Flay against the duo of Mario Batali and Emeril Lagasse. Their challenge? Whip up five dishes using anything from the garden. The chefs harvested everything from fennel and collard greens to purple cauliflower and Japanese eggplant. Comerford and Flay won the cook-off. The 1,100-square-foot plot, about the size of a small apartment, has yielded more than 1,000 pounds of sweet potatoes, tomatoes, eggplant, broccoli, fennel, lettuce, other vegetables and herbs that White House and visiting chefs have used to feed the Obama family and guests. A nearby beehive, bolted to the South Lawn to withstand wind gusts from the president's helicopter, produced 134 pounds of honey. Some was given to spouses who accompanied world leaders to an international economic summit last year in Pittsburgh. This year, Mrs. Obama plans to involve more students from other schools. 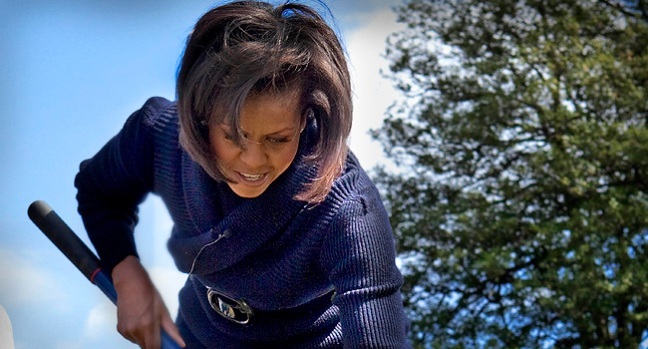 Mrs. Obama's plot is the first large-scale garden project at the White House since the "victory garden" first lady Eleanor Roosevelt planted during World War II. The government encouraged such gardens to make sure troops and civilians had enough to eat. Advocates of eating more fresh, locally grown food, including California chef Alice Waters, spent months lobbying the Obamas to start the garden. Mrs. Obama has said it was something she thought about doing before moving from Chicago. She talks often about her experience as a busy, working mother trying to feed daughters Malia and Sasha but relying too much on processed, fast food or takeout meals like pizza, not realizing the toll it was taking on the girls' health -- and weight -- until their pediatrician spoke up. The entire family began to feel better, she says, after she started serving more fresh fruit and vegetables, eliminated processed foods and cut back on sugary drinks. Her children were like sponges, she said, and soaked up the information about what foods do to their bodies. They even police her diet, too. "They started schooling me and lecturing me about what I should be eating, and what a carrot does, and what broccoli does. 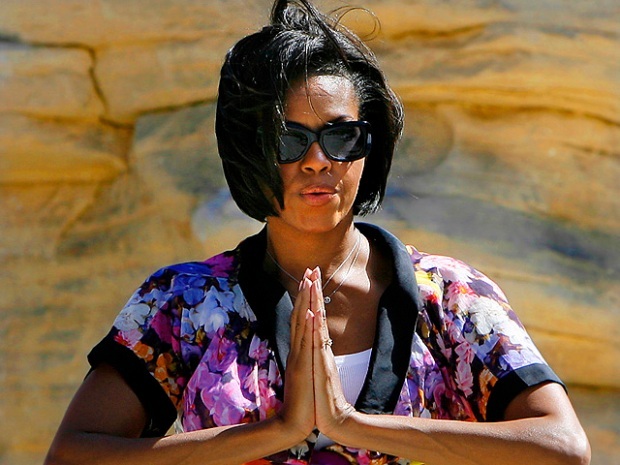 And sometimes they look at my plate in disgust now," the first lady said. Statistics show that two out of three Americans are either overweight or obese, and childhood obesity has tripled in the past 30 years. Mrs. Obama aims to pay more attention to childhood obesity this year in hopes that America's children will do like her daughters and help their families clean up their diets, too. Another benefit of gardening is cost. Mrs. Obama said it cost less than $200 to start the garden, which already has yielded a positive return on the investment. It's also boosting interest in gardening nationwide. "That's the first word out of people's mouths when we talk about gardens," said David Ellis, spokesman for the American Horticultural Society. Mrs. Obama's garden has "just made an incredible influence on people who haven't gardened before." The National Gardening Association predicted a 19 percent increase last year in the number of home-based fruit and vegetable gardens, compared with 2008. W. Atlee Burpee & Co., a large seed company in Warminster, Pa., saw a 30 percent increase in vegetable seed sales alone in 2009, compared with the year before, according to spokeswoman Kristin Grilli. The garden is popular at the White House, too. other chefs and staffers from throughout the White House office complex jockey to help care for it. Chefs love having fresh ingredients handy. White House pastry chef Bill Yosses spices up dessert with fresh herbs. Maricel Presilla, an authority on Latin American cuisine who cooked for a Latin music festival at the White House, said she was "absolutely flabbergasted" to find tomatillos in the garden. THOMAS JEFFERSON: Jefferson (1801-1809) hired the first White House gardener, who also was responsible for cultivating a "kitchen" garden. But it wasn't until 1825, when John Quincy Adams became president, that the vegetable garden and surrounding grounds began to flourish. Adams established a nursery for tree seedlings and a two-acre garden filled with vegetables, herbs and fruit trees, as well as flowers, shrubs and shade trees. ABRAHAM LINCOLN: By the 1840s, a new kitchen garden had been planted southwest of the White House. Receipts for the seeds show that Lincoln and his wife, Mary Todd, enjoyed an assortment of fresh fruits and vegetables. The kitchen garden was removed in 1871, during the presidency of Ulysses S. Grant, due to the construction of West Executive Avenue. FRANKLIN DELANO ROOSEVELT: First lady Eleanor Roosevelt used the White House grounds during World War II to show support for a civilian defense program for producing homegrown fruits and vegetables. Under the first lady's guidance, 10-year-old Diana Hopkins planted a demonstration "victory garden" in a flower bed south of the East Garden in the spring of 1943. Diana lived in the White House with her father, Harry Hopkins, an adviser to the president. Diana maintained the garden throughout the summer as an example for the country. BARACK OBAMA: First lady Michelle Obama, with help from local schoolchildren, planted a new "kitchen" garden last year on the lawn southwest of the White House. The garden is providing fresh, seasonal produce for the first family and White House guests to enjoy. Mrs. Obama also is using the garden to educate children about the importance of eating more fresh fruits and vegetables as part of a healthier lifestyle.